This recipe is made simpler with the use of a cocktail shaker, bar muddler, strainer, and measuring spoons/cups. Combine water and sugar in a saucepan and heat on medium-high heat until the sugar is completely dissolved. Remove from heat and add the basil stems. Let the stems steep in the syrup until the syrup cools and the flavor is infused. Any unused syrup can be refrigerated for later use. Remove the basil leaves from the stems and set aside. Prepare the basil simple syrup and let cool. Peel the cucumber and remove the seeds. Slice the cucumber into thin wedges (about 1 inch slices). 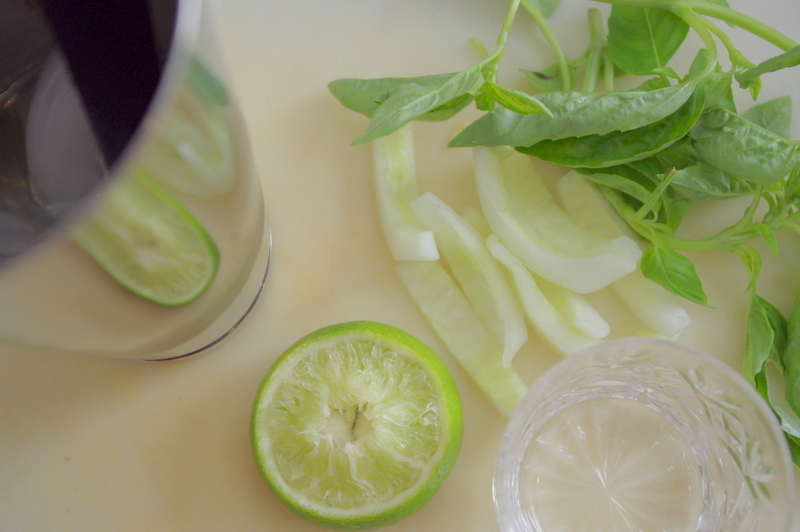 For each serving: Add a couple of cucumber slices and 4-5 basil leaves to the cocktail shaker and muddle. Add 1 1/2 Tbs of syrup, 1 Tbs lime juice, 2 oz Gin, and ice to the shaker. Shake until combined, then strain into a glass. Dunk a wedge of cucumber into each drink and garnish with a sprig of basil. Yes, popsicles are for kids in the summertime...but you might want to make a few extra of these for yourself. They make a fantastic cool treat for snacks, dessert, or even a light lunch. It's a tasty way to enjoy those luscious greens that are filling the CSA boxes this time of year! Place all ingredients in a blender (I prefer to use a Vitamix for smoothies), and puree on high until very smooth. Adjust ingredients to taste. Pour the smoothie into popsicle molds (available online and in many local shops). Freeze for 12-24 hours. Fruits: You can adjust the fruit in this recipe to suit your taste, but blueberries are my first choice because they don't have coarse seeds and the smoothie won't turn brown when mixed with greens. Of course brown is not necessarily bad...you can always add some cocoa powder and give it a chocolaty taste. Also, bananas are fairly essential for sweetness and texture, but hey it's a smoothie, make it the way you like it. You can also make layered popsicles with different flavor combinations. Recently we tried a red-white-and blue popsicle made with the following layers: strawberry coconut, peanut butter banana, and blueberry kale. The kids keep begging for more. Flavor & Texture: Nuts are also optional, but they add protein, as well as richness to the flavor and texture. If you don't use nuts, add a little oil, coconut milk (unsweetened cold-pressed in a can), or cream to the mixture to balance the bitterness in the greens. The salt, lemon juice and oils or nuts are all important ingredients to get the right balance of flavor, and counteract any bitterness from the greens. Fresh v/s Frozen: You can use fresh fruit that has not been frozen, but the texture is more like ice cream when you start with frozen berries and bananas. If you want a real time-saver, blanch your greens and freeze them as well. Alternatively, you could puree them in a blender, then freeze portions in an ice-cube tray. You can pop out portions as you need them for smoothies. The Blender: A high powered blender like Vitamix is my first choice for making smoothies. There are many blender gadgets available, even specifically designed for smoothies. To get a truly smooth texture from high-fiber foods like greens and nuts, it's best to have a blender that can keep up with the demand. You can still make smoothies in standard kitchen blenders, but it may take longer, or the texture may be less uniform and smooth.